Ralph Nader and Dennis Kucinich have acknowledged that it is time for a left right alliance and are working with Ron Paul to make it happen. This entry was posted in All Posts News Politics and-or Videos, Anti-war, Dandelion Salad Videos, Elections, Paul-Ron-MD, Politics, Republicans, Ron Paul. Bookmark the permalink. And I have a Ron Paul website. http://www.oaklandMofo.com is mine too though. Hi Mobber, thanks so much for sharing your photos and having a Creative Commons license on them. Great shot! I also have a CC license on all of my photos. Cheers! erdk1 — LOL . understood . i am ron paul all the way in the primarys . that anti-imperialism voice needs to be kept alive. Thats a well made video, very concise. I remember last election cycle the way the Republican machine delt with Ron Paul is they simply excluded him from the debates – while they allowed Guiliani who was polling at lower numbers. The video makes a great point, without a primary challenger there is no voice for the peace movement, as in the actual moral arguments about the use of wars of aggression. 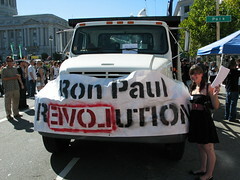 But having the fiscal concerns of the cost of war that Ron Paul positions himself with has the same outcome.